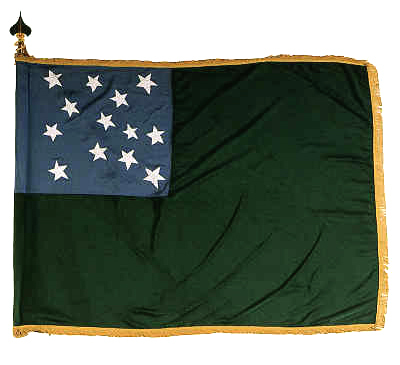 Vermont was the first state to join the union outside of the original thirteen colonies, although in a sense they were always a part of the federal union. The territory of present-day Vermont was previously divided among the states of Massachusetts, New Hampshire, and New York. The first newspaper in Vermont was the “Vermont Gazette, and Green Mountain Post-Boy” done in Westminster, first published on February 12, 1781. Only one of this issue exists and is in the Vermont Historical Society. Its first newspaper began later than all of the other first newspapers of the original 13 states. The weekly newspaper only lasted until 1783, published by Judah Spooner and Timothy Green, the latter of the famous family of printers from New England. It is notable that Vermont’s first newspaper was printed on the famous “Daye Press”, brought from England by Stephen Daye in 1638 and set up in Cambridge, Massachusetts. The press came into the possession of Harvard College in 1656, and in 1714 it became the property of Timothy Greene, who took it to New London, Conn., later set up in Norwich, Conn. by Alden Spooner, and in 1781 it was moved to Westminster, Vermont. The second newspaper in Vermont was founded on August 7, 1783 titled the “Vermont Journal & the Universal Advertiser” printed in Windsor by the partnership of Alden Spooner and George Hough. The newspaper continued publishing into the 20th century. Other 18th century Vermont titles included “Herald of Vermont“, Rutland, 1792; “Rutland Herald“, 1794; “Fair Haven Gazette“, 1795; “Farmer’s Library“, Fair Haven, 1795; “Burlington Mercury“, 1796; and “Federal Galaxy“, Brattleboro, 1797. 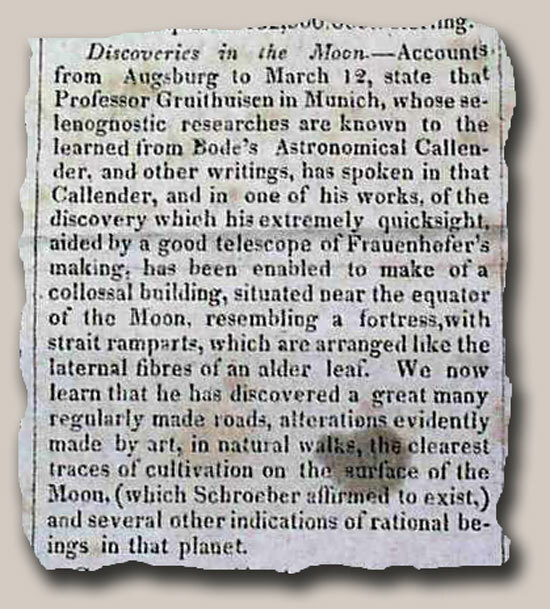 The “Bellows Falls Intelligencer” newspaper from Vermont, issue of May 10, 1824 has an interesting article reporting evidence of life on the moon (see). It’s interesting that astrological science was so rudimentary in 1824 that this report was to be believed by those who read it, although providing some humor when read today. An article in the August 14, 1840 issue of The Citizen Soldier, Vermont, yields at least one perspective on how to be a successful student. Kids, please don’t try this at home. What does the phrase “having cold feet” mean anyway? A few years ago while looking for Revolutionary War content for the catalog, I was both surprised and delighted to discover a report in the February, 1781 issue of Gentleman’s Magazine that mentioned the famous Green Mountain Boys of Vermont, and their equally famous leader Ethan Allen. The report reads: “Letters of a late date from America, formerly a rebel colonel, who resided at Bennington, in the upper part of New York, not well used, as he thought, by the Congress, has marched off with six hundred Green-mountain Boys, as they style themselves, and joined Major Carlton at Ticonderoga; and it is thought other townships will follow their example.” Although I have seen various newspaper reports mentioning Ethan Allen, this was the first and maybe the only reference to the Green Mountain Boys that I have seen in my twelve years at Hughes Rare & Early Newspapers. If you’ve come across another report mentioning the Green Mountain Boys by name, feel free to share it. Editor’s Note: Marc Pompeo is one of our in-house historians who has been on staff for more than a decade.